On September 15th 2006 the Palisades Historic Trail turned 30 years old! Organized in 1976 under the leadership of Carl T. Buscher and a team of dedicated volunteers the Palisades Trail has played host to thousands of scouts over three decades. The Palisades Trail runs along the New Jersey side of the Hudson River from Fort Lee to Camp Alpine. In actuality there are two trails, The Shore Trail is 12.5 miles in length and usually takes more than six hours to hike. The Shore trail runs along the bank of the river. The Long Path is 11.3 miles in length and can be completed in 6-7 hours with stops. The trails are closed December thru February and if ever he Parks Commission determine the area unsafe. The Trails can be hiked in segments and in either direction. To celebrate the 30th anniversary of the trail a commemorative patch has been commissioned in limited quantities. 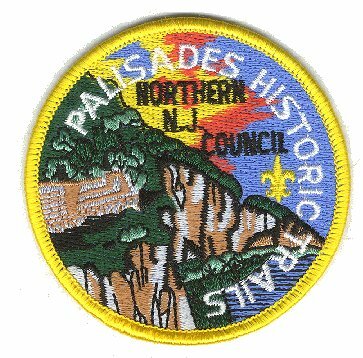 Scouts can earn the patch by completing the Palisades Historic Trail Hike.